This item is a Teletype Automatic Send and Receive unit, made by Teletype in USA around 1970. It has a grey metal and plastic casing with a paper tape punch, keyboard, page printer, reperforator and tape transmitter. This unit could transmit information directly from the keyboard or from the paper tape and receive information from page printing or by punching paper tape. Tape could also be punched from the keyboard and stored for later transmissions when the device was offline. 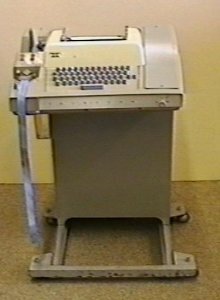 This ASR is a 33 Model, an electromechanical teleprinter which was designed for light office duty. 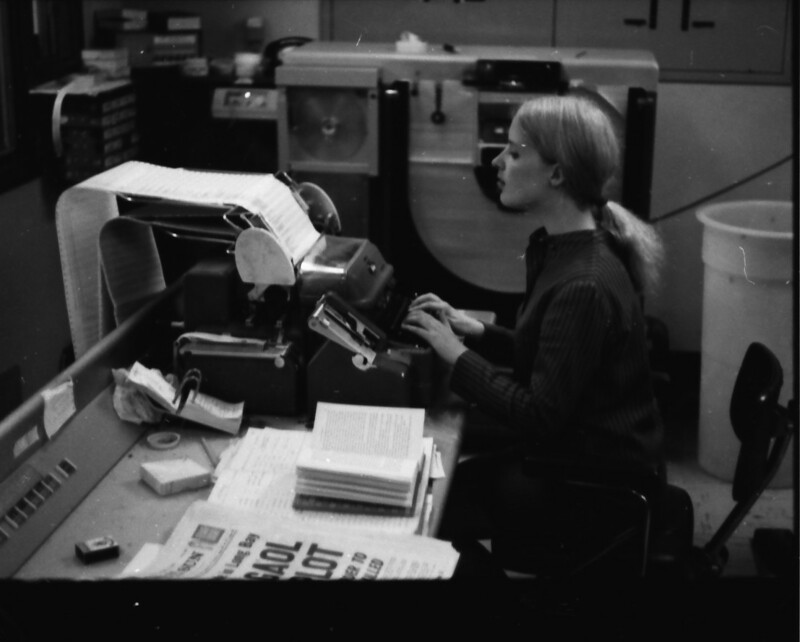 It was cheaper than earlier machines from Teletype and was designed to fit into a small office space and operate for about two hours per day. Many of its parts are not heat treated and hardened and some adjustments can be made by bending metal bars and levers. Its maximum speed was ten characters per second. The ASR contained an answer-back mechanism, at the start of the message the sending machine could transmit an inquiry character and the recipient machine would respond automatically. This meant that the sender could verify that they had connected with the correct recipient. The code was also sent back at the end of transmission to confirm that the connection had remained unbroken and correct through the transmission. The receiving machine did not require an operator in order to send these codes which meant that messages could be sent across time codes to closed and empty offices. Teletype originally designed this model for the US Navy and introduced it as a commercial product in 1963. There were three versions of the Model 33, the ASR (Automatic Send and Receive), the KRS (Keyboard Send and Receive), which lacks the paper tape reader and punch of the ASR and the RO (Receiver Only),which did not have a paper tape reader, punch or keyboard. The model 33 was one of the first products to employ the seven-bit upper-case ASCII code and was widely used with early minicomputers because of its compatibility and affordability. The Teletype Corporation was a part of the American Telephone and Telegraph Company and was responsible for the research, development and manufacture of communications equipment. They are most famous for their electromechanical teleprinters like this one. This particular ASR was used as a terminal with the first PDP-11 computer in Queensland from 1973 and was later used with a phase ionosonde, a form of radar used to explore the ionosphere, until 1984. Martin, James, "Telecommunications and the Computer", 2nd ed, Prentice- Hall, 1976, Ch3.